Rock, in Geology, is a natural substance that is aggregated with minerals and a few non-minerals materials such as fossils and glass. The forming of rocks is typically a natural process and this is why it takes time to get bonded with each other. Rocks are the building blocks of Earth’s three materials –Lithosphere, Asthenosphere, and Mesosphere. Rocks are categorized under three main classifications – Geological classification, Physical classification and chemical classification. Many divide rocks under the names of – sedimentary, Metamorphic and Igneous, though. The content discusses the geological classification of rocks and brings out different facts of rocks. Igneous rock, also known as magmatic rock, is composed of magma or lava. Cool and solidified lava forms this type of rock. Igneous means heat or fire and it goes as per the process of producing this rock. Generally, molten material or magma stays below the earth crux, and melting of the magma is caused by mainly three reasons – increase in temperature, decrease in pressure or a compositional change. The solidification of magma has been done by two ways – intrusive ricks (composition below the surface) and extrusive rocks (above the surface). Igneous rocks are also categorized under three names as per their composition and the production. These three types are – Volcanic rocks, plutonic rocks and Hypabyssal rocks. Volcanic rocks: such type of rock is formed on earth’s surface when magma spills out onto the earth and gets cooled and crystallized. Plutonic rocks: unlike volcanic rocks, this type is composed beneath the earth’s surface. The cooling and crystallizing process of magma are done under the earth and this is why it takes time to complete the formation process. Hypabyssal rocks: such rocks cools and crystallizes at a shallow depth of the earth’s surface and it takes less time to form rocks as compared to the plutonic rocks. The rock is composed in a very comfortable environment and gets a proper crystalline structure. 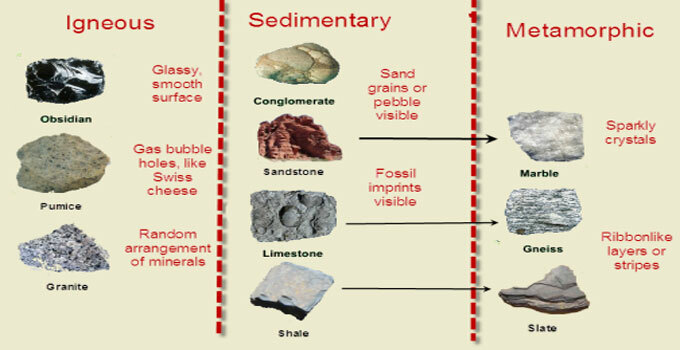 Sedimentary rocks are produced by the accumulation of materials on the earth’s surface. Such accumulation is mainly caused naturally through the deposition of materials. The secondary materials are at the core of the sedimentary rock, which consists of sands, shells, pebbles, and other material fragments. They are accumulated in layers, and as the time goes, the bonding between components gets stronger resulting in the formation of rocks. Metamorphosis is another type of rock, the formation of which is done beneath the surface of the earth. Such type of rock is composed when the sedimentary or igneous rock is changed because of their exposition to high temperature and pressure deep beneath the surface. It has ribbon-like layers and shines brighter because of its clear crystalline structure. A large tectonic movement is needed as it moves and shifts the rocks produced beneath the surface.